Recently No7 released their HydraLuminous Moisturising Foundation and concealer, along with a range of skin care products. These are all supposed to help people with dry skin and the foundation is supposed to help to improve your skin over time, like an additional skin care step within your makeup routine. If you’re thinking of trying it I’d recommend giving it a go soon as, at the moment, it’s on an offer where everything in the range is £10 so you’d save £5 off the RRP of £15 on this foundation and more on some of the others. I wouldn’t normally buy a foundation without testing it first but I know that their lightest shade, Calico, is a pretty good match for me and I have drops that can lighten or darken it if the colour match was a total failure. The idea of a medium coverage foundation from a company that my skin gets on with and also works for dry skin sounded too good to be true so I had to give it a try. I realised I haven’t actually done a game review for a while but I love the Rusty Lake series and so when the new one came out I had to play it. Rusty Lake Cube Escape Paradox is the tenth in the cube escape series and the first chapter is completely free with the option of paying £1.99 to get the second chapter. It doesn’t need the second chapter, it could stop after the first, but it does tie a few loose ends together for the entire series. You also don’t need to know the previous games but you do find yourself recognising scenes or characters popping up from the previous nine, even the ones that seem unrelated so I think it’s a good idea to play some of the games first, I’ve listed the ones I think are the most relevant further down. It’s getting cooler so it’s getting to be bath time of year again for me. The Body Shop has recently released a few of their own solid bubble baths with these small Bath Bubbles in Pink Grapefruit, Coconut and Moringa so I decided to give the Pink grapefruit a go as it used to be one of my favourite scents from them and I do love a good citrus scented bath. These are small, they weigh 28g, but at £1.50 they’re what I’d call good pocket money products. They’re the kind of bath products that younger teens might be able to buy themselves if they wanted to try something new or they’re great as a small treat for yourself or a gift for someone else. I didn’t really do much sales shopping this year, well compared to normal anyway, but I saw that Unicorn Cosmetics were having a sale and couldn’t resist a peak at what they had on offer. They’re the original creators of the unicorn brushes that have been everywhere this past year and the makeup brushes are so pretty I did end up getting some. This first one is the Bubbles Fan Brush and is from the Mermaid brushes collection, which has four brushes with different colours and styles of mermaid tail one them. In the sale this costs £14.99, normally they’re £17.99. The mermaid brushes are all face brushes and they each have a flexible tail, it’s made from silicone which is easy to clean and feels slightly rubbery so has a great grip. This may sound like an odd thing to say but, when I first started to use makeup (I was late compared to a lot of people) the fan makeup brushes always seemed to be one of those brushes you had to know what you were doing with. I’ve never had one and I realised that there are definitely gaps when it comes to my makeup brushes now that I’ve started to expand what I do with my makeup beyond basic eye looks and some liquid foundation. I guess I bought this one over the others as it is so different and I’ve recently started to try highlighting and it’s just so pretty. I feel a bit like there have been quite a few hauls recently but it’s that time of year when I end up buying more. I promise there won’t be too many, I just wanted to get this one up as the advent calendar is still in stock (as I’m writing this) and a couple of the things are Halloween so I’m not sure how much longer they’ll be around. I think Marks and Spencer may have made more advent calendars this year, they seem to be in stock for a while longer than normal, or maybe it’s just the sheer number of beauty advent calendars that are around so they have less competition but whatever the reason they were available online longer than in the past and, though they’re sold out online, I’m pretty sure they’re in most stores, the online stock checker lists them well into double figures for some. Value wise it is one of the best value for the price, at £35 and an estimated overall value of over £250 it’s a big saving, but you do have the slight snag of having to spend £35 on other things to get this great price. However, as it’s Marks and Spencer and they have such a range of companies they sell, it really isn’t hard to spend that. I only needed the one Stila set I bought for it to go over that. As I know some people don’t want spoilers I haven’t included any of the products that are in the beauty advent calendar. If you want to know more you can click the link as it has a list of the products on their and I might do a small post soon with my thoughts on the few that I’ve already used and which are cruelty free, vegan, etc. if anyone’s interested. 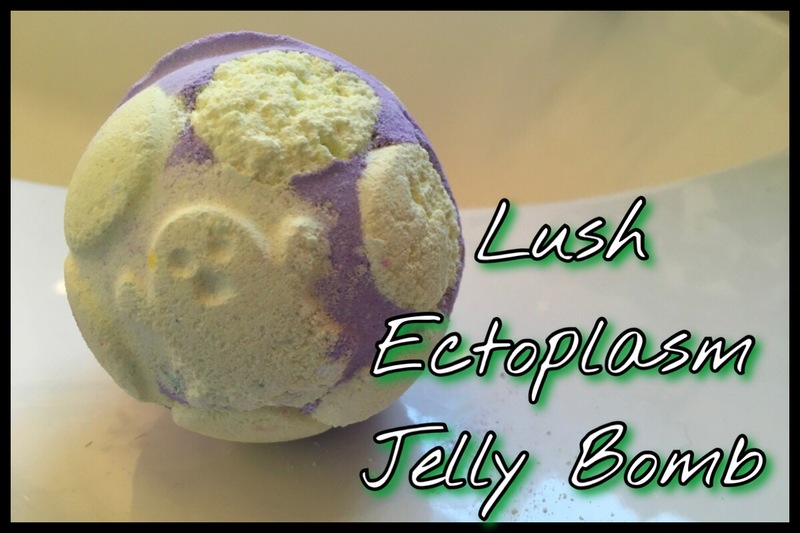 I’ve only just realised how close we are to Halloween and I still hadn’t tried a couple of the Lush Halloween limited edition products so I had my first ever Lush Jelly Bomb bath with the Ectoplasm Jelly Bomb (£4.95) which was interesting and didn’t turn out quite as I expected it to. The Jelly Bombs are a recent product type for Lush, I think it’s only been a few months since the first ones were released, and they claim to give you a jelly layer in the bath bomb alongside the normal fizzing. This version is limited edition for Halloween and is a mix of a sort of pastel neon yellow and a pastel purple with a ghost on the front, which I think is rather cute. They’re very crumbly in the outside so need to be wrapped in something if you want to keep any as they do leave a trail of bath bomb dust everywhere they sit. Another week and another face mask. I’m surprised by these Lush jelly face masks, I honestly thought they’d be a bit of a novelty product to start with but the FOMO one I tried last week made me excited to give this 1000 Millihelens Lush Jelly Face Mask a go. This one is also £4.95 for the small pot but, judging by the previous one I tried they’ll last quite a while as you really don’t need much. The 1000 Millihelens mask is meant to target problem skin with witch hazel and green tea which seem to be common ingredients to help acne prone skin. It’s another clay based mask, though I don’t think this formula has as high percentage of clay in there as the FOMO one did. As these are jellies and self preserving there’s no need to keep them in the fridge, you simply tear a piece off, rub it between your hands and the leave it on for five to ten minutes, then wash off as you do with most traditional clay masks. When I saw that Lush were coming out with new products I had to check some of them out and the new range of jelly face masks really intrigued me so I decided to get the two that seemed like they’d suit my skin needs the most. They come in the same size pots at the older style fresh face masks so I thought I’d get a few face masks out of each. They also claim to be self preserving and don’t need to be kept in the fridge which are both real bonuses for me as that is one thing about the older style that puts me off getting them more. These face masks are cruelty free, all Lush products are, and it says these specifically are suitable for vegans. FOMO is aimed at evening skin tone and calming your skin with Calamine, Kaolin and Rose Absolute. It’s a solid jelly that you take a piece off, rub between your hands and then apply it to your face for five to ten minutes before washing off so I was interested to see how this would work. The new jelly range is available online or in stores and cost £6.95. I’m not sure if they’re included in the masks that you can get free with the black and clear pots, I’ll have to ask next time I go in as that’s how I get all my Lush face masks at the moment. A couple of years ago I bought the Soap and Glory Perfect Ten limited edition eyeshadow palette and I saw the one they brought out this year so I thought I’d buy the newer version too. I know they brought one out last year but my old one has got to the point where I’ve hit pan, for the first time ever in an eyeshadow, so I thought I’d see if the new one is as good as the old. There are some obvious differences, the colours chosen being the main one as the older one is mainly neutrals, this one has more smokey colours, and the fact that over half of the colours are mattes this time around but the range of colours in there still looked good so I gave it a try. The Perfect Ten eyeshadow palette contains ten eyeshadows in a mix of finishes, there are 6 mattes and four with degrees of shimmer (one of them is probably more of a glitter than shimmer really). It costs £16 from Boots and is in the three for two offer on Christmas gifts. As it’s limited edition I’d say get it before Christmas if you’re interested as they sometimes appear in the sales after but last year they sold out before then. If anyone’s interested the older one still seems to be on the Boots website, I’m not sure if it’s a permanent line product now maybe as it’s £10 but it does have exactly the same product names so I’m guessing they’re the same formula as the original. My original post on that one is one of my first posts and you can find it here, it does have a review of the colours in there and I’d say the old one is a good palette, it’s still one I use today so it must be doing something right.